Blog | Palmetto Compressors Inc.
We’ve all been there. I would wager we’ve all done it. When it comes time to get an oil change or replace our windshield wipers, we want to go for the store brand, not the genuine replacement part. It’s cheaper. Isn’t it? It’s just as good. Right? I’m not an automotive expert, so I’m not going to debate the merits of saving a few bucks on windshield wipers. I would, however, like to point out a few key points to consider when you are purchasing replacement parts for your compressor. 1. Efficiency: No doubt a key factor when you were purchasing your compressor was energy efficiency. You did the research, looked at the CAGI datasheets, and compared performance. That compressor was tested as it was packaged by the manufacturer using the manufacturer’s original parts. This may not seem like a big deal, but keep in mind that every component inside the compressor is crucial to its performance, thus its efficiency. For example, intake filters are susceptible to pressure drop; every 2 psi in pressure drop costs 1% of compressor horsepower in efficiency. If you use an aftermarket filter, you might not get the compressor efficiency you are expecting. And that will cost you money—possibly more than you are saving by going with the cheaper part. 2. Service Intervals: Your unit came with a manual that has a host of useful information from the manufacturer—including recommended service intervals. Those intervals are based on the extensive testing done using their original parts included in the machine, not aftermarket ones. You might be ok using the same guidelines, but there is really no way of knowing simply because the manufacturer didn’t test the unit using those aftermarket parts. 3. Quality risks: The material compatibility of the aftermarket parts has not been tested with the compressor. Neither has the durability. Quite often we see new issues develop, for example higher oil carry over from using a sub-par replacement separator element. Other issues such as higher pressure losses after shorter operating periods, compromised machine safety, and air quality not being met are also common. Further, depending on what your manufacturer’s stated warranty is, using aftermarket parts can void it. To be fair, there are quality aftermarket parts manufacturers out there—their products, however, have just not been thoroughly tested with the compressor, which can lead to problems and concerns. Be careful and be aware. Your best bet is to contact the compressor manufacturer and go with their genuine replacement parts. I didn’t really save any money by getting the store brand windshield wipers. They lasted maybe four months. The genuine replacement part wipers that are now on my car have lasted more than a year and they only cost a few dollars more. They also work better. PVC is lightweight, inexpensive, and easy to purchase at any local building supply store, making it all the more attractive when it comes to selecting piping materials for a compressed air system. Using PVC, however, has its risks and in certain areas it may not be code compliant. It also carries a static charge which can lead to spontaneous combustion in certain dust filled environments, it’s subject to bursting (yes bursting), and the adhesives used in installation are not compatible with all types of compressor oils. Despite the safety issues, many small shops and even some larger plants continue to use it. In a room with 4 huge, expensive injection molding machines and many employees, he saw no need to change. Different strokes, I guess. 1. The remains from a 2” PVC pipe burst at a manufacturing plant in Texas. Thankfully no injuries, but some unscheduled changing of underwear. 2. 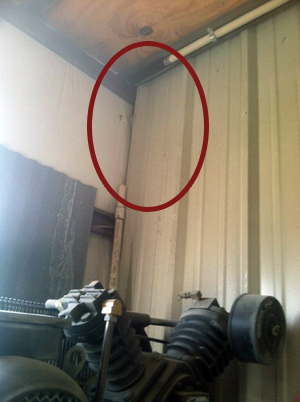 In a small customer paint shop in Texas, a large section of PVC pipe burst during normal operation. Again, there were no injuries. If you have PVC pipe in your shop or factory, make sure it’s pressure rated and regularly check it for signs of cracking. For those of you considering using PVC pipe, I urge you not to—it’s really not worth the risk. The holidays are over and for many plants that means seasonal shut downs or lower production demands are also a thing of the past. While everyone is gearing up to start this year with gusto, don’t forget to stop and take a breath before bringing your equipment back online. Here is a short list of points to check on your compressors to make sure they are ready to get back to work. The first three tips are important to check after any shut down period. The last two apply for compressors that have been offline for an extended period of time. 1. Check the ambient temperature. If it is below 40°F, the compressor will need either a cabinet or ambient heater in order to start safely. If it’s too cold, the lubricant will not circulate through the unit properly, causing a cold start. Cold starts can cause unnecessary wear and tear on the motor and airend and sometimes even catastrophic failure. 2. Make sure the motor bearings are properly greased. Some compressors have external lubrication points which makes re-greasing easy. Otherwise, be sure to check the grease zerks (fittings) on the rear and front of the motor. 3. If you have any filtration in your compressed air system, valve off the compressors before starting and then slowly open the valve to the system. This will prevent the filter from being blasted with high velocity air—which can cause damage to the filter elements and can also cause contaminants to enter the compressed air stream. To prevent this from happening in the future, consider installing an air main charging valve. 4. If you have equipment that has been offline for an extended period of time (6-8 months), the airend will need to be primed with oil. This is typically done by removing the inlet valve and pouring oil directly into the airend. Check your service manual and consult the compressor manufacturer for specifics on the type and amount of oil to use. Don’t forget that during periods of shut down it is good practice to run the unit once a week for a least 30 minutes. This will help prevent corrosion—in particular on the airend and in the fluid separator tank. 5. For variable speed drive compressors that have been sitting for more than 12 months, they will need to have their capacitors re-formed before start-up to prevent severe damage to the electrical panel. Contact the manufacturer for help. When putting together a compressed air system, temptation is all around you. You want the best system, but having the best doesn’t mean grabbing whatever looks good. Build a system that meets your needs not your wants. Focusing on your system’s needs and avoiding these seven deadly sins will keep you from needing to confess when your utility bill arrives. Lust— Don’t lust after a variable frequency drive compressor. Many utilities offer rebates for a VFD, but they are not always the best solution. Sellers often make blanket claims of huge savings, but if your compressor will run fully loaded more than 75% of the time, savings are very limited. Keep in mind that they are more expensive and have drive losses which need to be considered. If you have an application where the load varies between 40-80% of compressor capacity, then a VFD makes sense. Do the math before you buy one to make sure your system will benefit from using this technology. Gluttony— Don’t be a glutton with your air treatment. Dry air sounds great, but there is such a thing as overkill. And overkill is expensive. This is especially true for larger, industrial compresse d air systems supplying multiple processes. Take a hard look at your system and determine what level of filtration and dew point each segment needs. If you need a desiccant dryer for only part of your process, then size it for that part only. You’ll not only save by buying smaller capacity equipment, but also on pressure drop, air loss, and energy. Greed— don’t be greedy for air by oversizing your system. Bigger is not always better. Oversizing means you are paying for more energy than you need to. In some cases, if the compressor is too large for the demand, it may not come up to temperature, causing excess condensate. The machine will cycle on and off, which puts unnecessary wear and tear on the motor, valves, and seals. Figure out the amount of air you need for your system and select a compressor that will meet it. And, if you determine your load varies widely, consider using a VFD. Sloth— Don’t be lazy attending to leaks. Leaks occur and reoccur and need to be continually monitored and repaired. The US Department of Energy estimates that as much as half of all compressed air is wasted, with an average of 25% lost to leaks. I’ve seen annual leak losses range from $3,000 for smaller systems and up to $600,000 for larger ones. Check for leaks and repair them once you find them. You’ll be putting money back on your bottom line every time you do. Wrath— Beware the wrath of poorly controlled compressors. If you notice pressure spikes, disruptions in your air supply, or compressors cycling on and off, that means the compressors need to be controlled with a master system controller. A master controller monitors system demand and selects the right combination of units to meet it in the most efficient way possible. Don’t leave them to their own devices. Keep them under control. Envy— Don’t be envious of other plants with the newest technology simply because it is new. Choose what is best for your application. Some installations are using the latest in remote monitoring and taking advantage of cloud-based solutions. Good for them. Don’t let the latest and greatest distract you from your system’s needs. Stay focused on what is right for your installation. Pride— Don’t be so proud of your system that you fail to monitor its changing needs. You’ve worked hard to put together an efficient system and in the process you’ve saved a lot of money in energy costs. Don’t rest on your laurels. A good way to stay on top of your system is by doing an annual compressed air audit. This will help you see trends and react to any changes that might be happening in your demand profile. Kaeser Compressors, Inc. is proud to announce their latest advancement in air treatment technology. The Secotec TF models push the boundaries of compressed air refrigerated dryer performance further than ever before thanks to a game-changing thermal storage system. Compared to previous designs, these models are more efficient, have lower pressure drop, and a reduced footprint. The extremely efficient Secotec TF units handle flows up from 520 to 1060 cfm. Kaeser’s innovative Secopack LS thermal storage system contains a phase-changing material (PCM) that is 98% denser than conventional storage media. Thermal energy is stored as the PCM cycles from a solid to a liquid state. This makes the Secotec TF units up to 60% lighter than other thermal storage dryers. The dryers’ internal design also makes it possible to reduce pressure loss across the dryer to 2.2 psi (compared to 2.9 and higher for conventional models). Air-cooled and water-cooled versions are available. To learn more about the new Secotec TF dryers, visit www.kaesernews.com/Secotec_TF. Kaeser is a leader in reliable, energy efficient compressed air equipment and system design. We offer a complete line of superior quality industrial air compressors as well as dryers, filters, SmartPipe™, master controls, and other system accessories. Kaeser also offers blowers, vacuum pumps, and portable diesel screw compressors. Our national service network provides installation, rentals, maintenance, repair, and system audits. Kaeser is an ENERGY STAR Partner. Kaeser Compressors, Inc. has achieved the next level of compressed air efficiency with the newly redesigned ASD rotary screw compressors series. These units deliver the “built-for-a-lifetime” reliability, simple maintenance, and sustainable energy savings you expect from the Kaeser name and are available in 25, 30, and 40 hp with flows from 106 – 194 cfm and pressures to 217 psig. Kaeser has improved the new ASD series’ specific power over the previous design by up to 6% through a combination of true direct drive design, premium efficiency motors, lower internal pressure differential, and optimized airends. These units are now up to 30% more efficient than the competition. Additional built-in heat recovery options provide even more energy savings potential. New features include an enhanced cooling design, eco-friendly filter element, integral moisture separator with drain, and an Electronic Thermal Management system. ASD compressors also come standard with Sigma Control 2™. This intelligent controller offers unsurpassed compressor control and monitoring with enhanced communications capabilities for seamless integration into plant control/monitoring systems. ASD models are also available with an integrated dryer for premium compressed air quality. To learn more about the new ASD series, visit www.kaesernews.com/ASD. For additional information, please call 864-409-9330. PALMETTO COMPRESSORS, INC. is now looking for an Air compressor technician. Keep up to date with the latest news and developments from Kaeser. Check out Kaeser’s blog “Kaeser Talks Shop” at http://kaesertalksshop.com. This month’s topic will help you understand and determine ways to turn your air compressor into an energy source. Kaeser recently installed a compressed air system for Gas Monkey Garage, the classic vehicle restoration shop featured on the Discovery Channel reality series Fast N’ Loud. “Monkeys” Richard Rawlings and Aaron Kaufmann, who painstakingly restore vintage cars, had been dissatisfied with their old piston compressor. When they moved to their new Dallas location, they called on Kaeser to provide them with a more reliable and powerful compressed air system. Learn more about the Gas Monkey Garage project on the official Kaeser site.